This came from Alan Bush's collection; only acquired a few 'Melodiya' in the part I bought (his R2R tapes of the 'Nottingham' Symphony must've attracted the other bidder - I went pretty high ...). Didn't check to see if this was available elsewhere - anyway, the Vinyl is good (MK export-quality wasn't..) and the LP transfer didn't have the usual older Soviet problems; bad distortion/strange fuzzy noises). The performance is the thing: and the sound is more spacious as 24/96. Thanks for the links: though I'd be wary of buying ancient Soviet LP's!!!!! Have something similar to the Ermler CD - Svetlanov 33C 10-10479-82 - Xmas 1974 broadcast "Pearls of Russian Symphonic Minatures" - but presumably that got a CD release? Yes, as you saw in the link, there are oodles of old Soviet LPs featuring some serious stuff in there! The internet prompts shorthand: I know the contents weren't the same (actually, more interesting...)! Speaking of Urania Records, the Bach-Leibowitz Passacaglia and Fugue BWV 582 Orchestral Transcription has been issued on a CD by Urania Records. But I don't hear that the transfers are good. Some people have been complaining about them. Do you plan to do justice to the Bach-Leibowitz Passacaglia & Fugue, since it exists only on LP (and Urania Records somehow screwed things up)? As far as I am concerned, Leibowitz has the following orchestral transcriptions. Instrumentation : 1,1, 2+1, 1, - 1,1,1,0 - hp - pf. The answer is: "I don't have them" - nor does virtually Anyone: the UK market was dominated by EMI/Decca in the '50's: and that's what collectors purchased (in pretty smallish quantities; and not those LP's that later became 'rarities'). For 50's CCCP material you need people in Russia (mainly) who have access to those discs - hopefully not previously ruined by the original owner/state-manufactured 'record player'; and that the guy doing the transfer doesn't screw-up the sound with various 'software' (this is hand-edited: no electronic manipulation, except the EQ-curve) - probably why it sounds good (and you want More!!!). BTW: CD standard is not good enough....even though there are traces of tape/tape-to-disc distortion to be heard on this...(if you listen closely: like I do - for all the 'blemishes' (tape edits are also corrected, where possible, as part of this 'service'). These are two topics that I have a very soft spot for. 2) Orchestral works (Overtures, orchestral sketches, orchestral pictures, orchestral suites, symphonic poems, etc) by Russian and Soviet composers. Russian/Soviet orchestral material on post-1963 LP I wouldn't anyway upload...even if I had the time. Bach orchestral-transcriptions rarely appeared UK/LP-era (only have the Stokowski PFS + Munchinger LXT2668 (Fugues BWV 947/1000 (arr by him) + M.Offering Ricercare 6pts (Edwin Fischer) - but wouldn't bother trying to edit that 1952 LP (never on CD): not on that list, it seems. 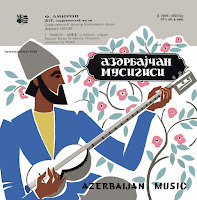 Anyway: trust you found the Niyazi a exciting listen: I doubt there was ever a UK-issued Amirov LP (even on HMV Melodiya) 1950-1980... UK orchestras are anyway not too idiomatic in 'obscure' Russian material (had considered uploading a 1957 RCA: Fistoulari/LPO 'Red Poppy'/'Caucasian Sketches' - but it then got its first stereo release on Decca Eloquence CD). "AMIROV (1922-1984) wrote highly coloured music - as brightly lit as ASV's cover art. This is ethnic-dramatic and ranges from poetic middle eastern exotic to gaudily raucous. You might well end up grouping these works written during the period 1940-1970 with those of Khachaturian. The Moscow Phil under de Almeida play up the barbarous colours in a 1996 recording. This Azerbaijani composer rejoiced in a Rimskian tradition and poured into it colours that rage and dazzle. No wonder that Stokowski took up the first of his Azerbaijani Mugams (nationalistic rhapsodies) coupled on Everest with Scriabin's Poem of Ecstasy and, I think, other works. It can be a little episodic and is in the Borodin Polovtsian tradition. This music is quite addictive." As you can see on MusicWeb - RCA's Khachaturian Sym.1 LP hasn't had a CD release (it's very nice). Well, yes... But which Khachaturian RCA recording is it? Conducted by whom? Pr/Eng: Brian Culverhouse:- 3-4 Oct 1978, Abbey Road. (Unless Michael Herman 'missed' a CD release). Luckily, you're spoilt for choice with CD Blogs that have Soviet obscurities. Well, I am not so fond of Khachaturian's Symphonies, but Tjeknavorian is a long-lasting champion of Khachaturian works. Yes, indeed. we are spoiled for choice with blogs that have Russian-Soviet stuff. On the other hand, there are russian torrent fora to search for stuff. For some obscure (to me) reason Russian's seem interested in very Old English music (Purcell, etc). Doubt Melodiya stereo LP's are worth 24/96: their DMM are mostly Digital (?) - and I use rather better Cartridges than Ortofon OM5E !!!!!!! (the last 3 here are one of my JVC X-1 shibata, otherwise mostly Decca Gold)..though not seen that site before (Cyrillic confuses me...). Thanks so much for your efforts. I have listened again after many years to some old records my father had and used to play at home when I was a kid. Schuricht's Wagner, Ansermet's Petrouchka and some others shaped the musical landscape of my childhood and youth, during the 50s and 60s. Thank you for this chance of having this wonderful records again! Take care. Greets from Spain! Am probably quite well-known (...). Glad you enjoyed these 'old records' - I think I'll stop, though: before I become as old as my Father!